An announcement by Transport Minister John Baird that the federal government will study the use of 15 passenger vans for school transportation is being applauded by a Bathurst mother. 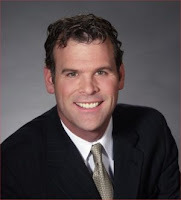 Minister Baird's announcement, made last week, is a "huge step forward that will change the face of student safety in Canada," said Isabelle Hains in a news release. "I'm cautiously optimistic that the minister will do the right thing and ban these 15 passenger vans in schools," she added. 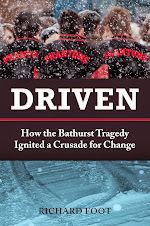 Mrs. Hains lost her 17 year-old son Daniel in a tragic 15 passenger van collision, along with six members of the Bathurst high School Phantoms basketball team and the coach's wife, on Jan.12, 2008. Sin then, she has become a strong advocate for change to student transportation safety in Canada. She travelled to Ottawa in May to witness the introduction of Bill C-522 by New Democrat Yvon Godin, Member of Parliament for Acadie-Bathurst, which called for the prohibition of 15 passenger vans for student transportation. The vans have already been banned for such use in New Brunswick and other provinces. Mrs. Hains was joined in Ottawa by Stella Gurr, a mother from Nanaimo, B.C. who lost her son Michael, in a 15 passenger van collision outside of Brandon, Manitoba in September 2008. Both women cite studies done years ago by national Highway transportation Safety Agency in the United States that recommended 15 passenger van be prohibited for student use. As a result, 43 states have banned the vehicles for student transportation. "These vehicles were designed for cargo," said Mrs. Hains. A 15 Passenger Ford Econoline Van like the one in which seven members of the Bathurst High School basketball team and the coach's wife were killed on January 12, 2008. 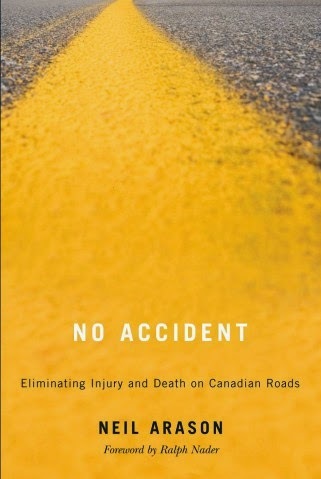 MP Godin, who also welcomed Transport Canada's decision, said in his own news release that the security review will include such steps as evaluating the safety and stability of 15 passenger vans, as well as brake tests and rollover threshold tests. "The testing will show once and for all that these vehicles are not safe for transporting passengers," said Mr. Godin. 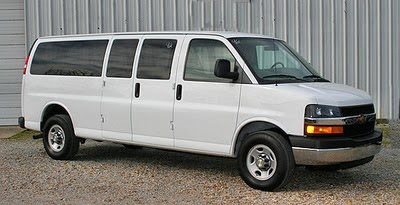 The 15 passenger Ford Econoline van in which seven members of the Bathurst High School basketball team and the coach's wife were killed on January 12, 2008. Minister Baird also announced that the issue of 15 passenger vans will be raised at the transport Ministers conference in Halifax, N.S. in September 2010. Mrs. Hains said she plans to be there. "Students depend on adults to make the right decisions to keep them safe," she concluded. "We believe the Minister will make the right decision." 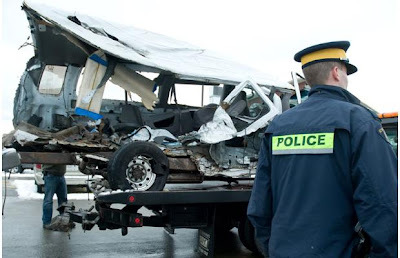 Last month, safety advocate Bryan Murphy was brought to Bathurst for a public presentation on the 15- passenger vans, which he successfully lobbied to have banned in Cowichan, B.C. The mechanic, school bus driver and union representative said it's imperative for the safety of Canada's children that the vans be outlawed for school use. Safety advocate Bryan Murphy speaks in Bathurst, New Brunswick, June 15, 2010. "I've come to realize, based on the number of accidents and the research that I've done, it's shown me that these vehicles aren't safe," Mr. Murphy said in an interview. He, too, was in Ottawa for the introduction of MP Godin's bill.